“Sustainable”: it’s a word on the mind of nearly every business owner in this day and age, especially in warehousing and manufacturing. As the pressure to ‘go green’ and adopt more environmentally-friendly methods of packaging, production, and distribution increases from customers and vendors alike, warehouses are trying to find any avenue possible where they can increase their sustainability and reduce their impact on their environment. Source more sustainable materials: The first step is an obvious one, but it’s the best place to start. Whoever your vendors are for packaging material, work with them to find more eco-friendly materials and/or packaging designs. Use corrugated cardboard when possible, eliminate blister packs when you can to cut down on plastic use, and work to avoid obviously hazardous substances like PVC, lead, and many forms of coatings and adhesives. Carefully manage the weight of your packaging. 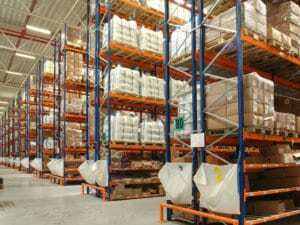 This step involves a slightly better understanding of your entire inventory, but it will pay off big in the long run. Get a rough estimate of the average weight of your inventory per packaging type (pallet rack, individual box, etc) and plan your packaging needs accordingly. This will help reduce wasted material and cut down on the amount of unused space and raw materials needed in the design of these items. Focus on reusable designs: Most packaging designs in warehouses are made to be used once and disposed of, but much like the wooden pallets lining your pallet racks currently, many warehouses could benefit from reusable packaging styles. Find options for modular, repairable packaging solutions that can be replaced on your warehouse shelves instead of thrown out, and for everything that can’t be immediately re-used due to damage, find ways to incentivize the consumer to recycle the packaging you provided last time; for example implement some kind of discount program for customers that return their packaging. Use the right packing materials: Even if your boxes and packages are all up to snuff, the cushioning material you use inside can have a huge effect on your ecological impact. Avoid using the more ‘traditional’ materials like polystyrene as those tend to contain damaging chemicals and are much harder to dispose of safely. Instead, use recyclable loose fill peanuts to protect your products and help the material get disposed of more safely. Perform sustainability audits: While these suggestions are good for getting off on the right foot, performing frequent evaluations of your entire packaging process to identify flaws and locate areas for improvement will help you maintain your sustainability going forward. Identify areas where better materials could be used, look for frequent examples of wasted space in packaging, and examine the overall cost of the packaging you use at regular intervals to identify further areas of improvement.